First create a three panel base by cutting a 4 1/4" x 11" piece of Wisteria Wonder card stock and folding it at 2 3/4" from the left edge. 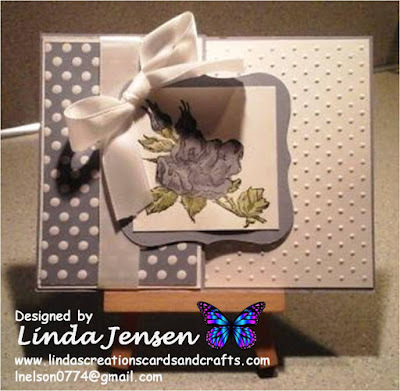 Then attach a 2 ½” x 4” piece of Stampin’ Up! Sweet Shop Designer Series Paper to a 2 5/8” 4 1/8” piece of white card stock, attach the ribbon around both layers then attach the white layer to the left panel. Next stamp your desired sentiment on a piece of 2 5/8” x 4 1/8” piece of white card stock and attach it to the center panel. Then dry emboss a 4 1/8” x 5 3/8” piece of white card stock with a Cuttlebug Swiss Dots embossing folder and attach it to the right panel. Next cut a label out of Wisteria Wonder card stock with a Spellbinders Labels One die and set it aside. Then cut a 2 3/8” x 2 3/8” piece of white card stock for the image. 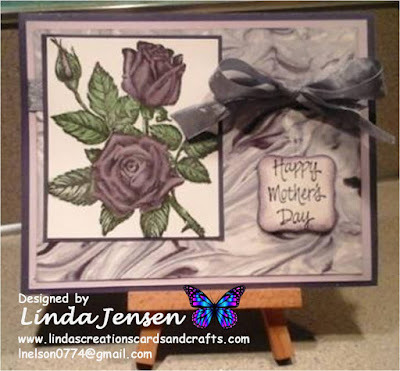 Next using a Stamp a ma jig stamp the image with Stazon Jet Black ink then watercolor it with an aqua painter and Wisteria Wonder and Pear Pizzazz ink pads. Then add Diamond Stickles and allow it to dry. Next attach the image to the Wisteria Wonder label then the label to the left panel and enjoy!